Jan-Jaap Minnema and Penny Parrot at Fraser Yachts send me simultaneous emails of a $1 million price reduction on the 49.9m motor yacht Grace E.
Built by Codecasa in 2004 and refitted in 2009, she accommodates 12 guests in six cabins, including a master suite and VIP stateroom on the main deck. An exceptional sun deck features a large custom gymnasium, spa pool and water-mist cooling system, while a five-person elevator connects all four decks. Twin 2,260hp Caterpillar engines give Grace E a range of 5,000 nautical miles. 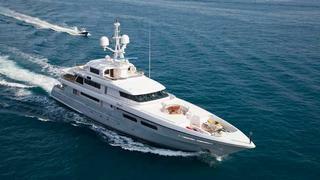 Lying at anchor off the Monaco Yacht Show, Grace E is now asking $18.5 million.